Click the "Backup Data" command on the File menu. VueMinder provides a built-in data backup feature, accessed via the "Backup Data" command on the File menu. 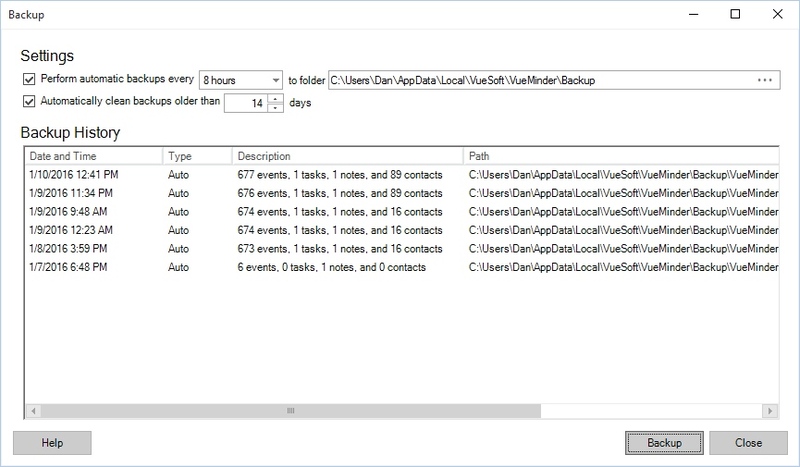 By default, automatic data backups will be performed every 8 hours to a "Backup" subdirectory in the VueMinder data folder. Backup files will be kept for 2 weeks and then automatically removed to free up disk space. These settings can be adjusted on the Backup Data window. A manual backup can also be performed. If data is ever lost or damaged, a previous backup can be restored by using the Restore Data command on the File menu. The backup and restore feature can also be used to transfer data from one computer to another. For example, if you get a new computer and would like to move all your VueMinder data from your old computer to the new one, use the "Backup Data" command on the old computer. Click the "Backup" button to generate a backup file. Copy this file to the new computer and use the "Restore Data" command. Click the "Browse" button on the Restore Data window and then select the backup file. VueMinder will restore from the backup and restart. Using this method, an exact replica of all your data and settings will be transferred. To enable automatic backups, click the checkbox. Backups are performed in the background and usually take less than a second to complete. You won't notice any performance impact by having automatic backups enabled. The backup interval can be adjusted from a drop-down list. The available intervals are 10 minutes, 30 minutes, 1 hour, 4 hours, 8 hours, 1 day, 1 week, and 2 weeks. VueMinder will record the time an automatic backup was performed, and wait the specified length of time before performing another automatic backup. If VueMinder isn't running when the specified interval is passed, a backup will be performed the next time VueMinder is started. The backup folder location can be entered by typing in a path or by clicking the "..." button and browsing for the desired location. We recommend selecting a secondary hard drive, cloud drive, or memory stick, in case your primary hard drive fails. If the specified location is offline when an automatic backup is scheduled, the backup will be performed the next time the backup location becomes available. By default, backups that are more than 14 days old will be automatically deleted. This keeps disk space use to a minimum. If you prefer to handle cleanup, or if you don't want old backups to be removed, uncheck the box. You can also adjust how old backups need to be before they are automatically removed, by entering a number of using the up/down arrows. The value can be between 1 and 365 days. Date and time - The date and time the backup was performed. Type - The type of backup. This can be Automatic or Manual. Automatic backups are generated when the setting to automatically perform backups is enabled. Manual backups are generated when the Backup button is clicked. Description - The number of events, tasks, notes, and contacts contained in the backup file. Path - The path where the backup was stored. The backup file name will also indicate the version of the software used when the backup was generated. Backup files end with a vbackup extension. A manual backup can be performed at any time by clicking the Backup button. A window will appear where the backup file name and location are specified. You can manually backup to any location, regardless of the path selected for automatic backups.